In order to rent a carpet steam cleaner, you have to know where you can rent one according to your location. Renting the correct carpet cleaning equipment is dependent on your needs, the type of carpeting, flooring, area to be cleaned etc. You also have to be wary of the type of carpet shampoo you use and whether you do want to shampoo your rugs and carpets since there are some advantages and disadvantages of doing so. Where can you rent a Carpet Steam Cleaner Machine? Why trust Rug Doctor? They are the holders of the prestigious Gold certification from the Carpet and Rug Institute (CRI). This means they were found to have an extremely high standard and professional grade cleaning system. They offer two main machines, the Mighty Pro® and the Wide Track®, where the Wide Track® has a wider cleaning path to enable you to clean a much larger space easily. They even provide cleaning solutions according to what types of dirt, stains and areas you wish to clean. For example, they have a spot and stain remover, a solution for high traffic area treatment, upholstery cleaner solution, an odor remover, urine eliminator, Oxy steam and many more products designed specifically to treat all of your common cleaning issues. These can be food stains, outdoor stains, oil based stains as well as if you need to clean high traffic areas like carpeted stairs. 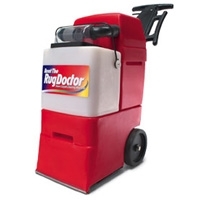 The Rug Doctor can be rented for a low price of $24.99 for one day! This option allows you professional grade cleaning without the professional price. With so many raving reviews, what are the cons of this service? • It’s a bit heavy, even with the wheels, so ladies may need some assistance lugging one of these into and around the home. Location: Where can you rent one of these amazing carpet cleaning machines? Check their Rug Doctor Store Locator to find one that is closest to you. They have numerous locations (approx 33,000) throughout the United States as well as in Europe, the Middle East and Asia. Stanley steam cleaners : the name and brand that is synonymous in households for carpet cleaning. This is one of the highest rated professional cleaning services that provide cleaning services not only for carpets but also tile and grout cleaning, furniture, leather, area rugs, auto, boats, RV’s, water damage restoration, air duct cleaning, hardwood floor refinishing and more. • Telemarketing can become a bit annoying as they follow up a lot. They are currently offering a $99 special and while it is a bit costly, if you want to hire a service that have been around for decades and have proven quality of service, then you should consider Stanly Steemers. Sears Carpet Cleaning services have won the Good housekeeping award and are also the holders of the Platinum seal from the Carpet Institute which is their highest award. Their method of cleaning involves spraying a specially heated solution into the carpet to loosen embedded dirt and then a powerful extraction with a special pH rinse to remove the dirt and the cleaning solution.